Rare street plan of Tainan, Taiwan. 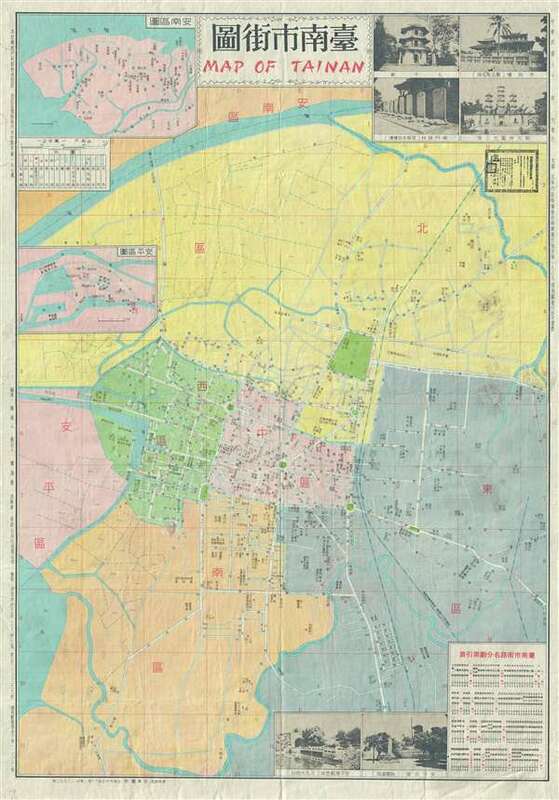 An uncommon Minguo 60 (ROC Calendar) or 1971 street map of Tainan, Taiwan. It covers from the River in the north as far south as Kun Lake (鯤鯓湖). Names all streets, districts, parks, and important transit lines. Several inset images of local historical sites. Tainan is the oldest city in Taiwan and also commonly known as the 'Capital City' (府城) for its over 200 years of history as the capital of Taiwan under Koxinga and later Qing rule. Today Tainan remains one of Taiwan's largest and most vibrant cities. Good. Some wear. Backed on original linen.